We offer a range of competitively priced services that can help you to keep your Evolution in top condition. For information about servicing and pricing, visit our [Servicing] section. We offer a wide range of services for your Evolution. From a simple oil change to a full performance engine build, you can rely on RG Motorsport for quality of service and competitive prices. This section shows only a sample of the services available, please call with your requirements if what you want is not listed. For information about standard servicing visit our [Service] table. For information about individual services, visit our [Individual Item] table. 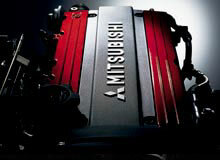 All other items used are genuine Mitsubishi Motors products. Sundries are items such as screenwash, brake cleaner, etc. Supplying and fitting of uprated hydraulic lash adjusters. Prices marked * are 'from' the price shown.